Your solution which will make it more difficult for cars will drive people and jobs elsewhere. It will cause the schools to relocate. More capacity doesn't automatically mean anyone will use it. There are a lot of empty streetcars around the country. Well then we better start buying up land and digging into people's front yards to build more general traffic lanes that'll just be as congested as the road is now a year after its completion. If we MUST build new lanes, though, we should REALLY consider making them non-car lanes. More cars will do far more damage to the local businesses and school attendance, in the long run, than bus lanes would, or bike lanes, or better pedestrian facilities. Seriously, prioritizing cars is what has GOTTEN us into this mess. Prioritizing them more will not do any good. If, at that point, people don't take advantage of the infrastructure, well then they'll get to deal with traffic either here or somewhere else. Their place will be taken by someone who can, as the area is just too in demand for it to sit empty. Transit will not kill that demand. This story, or a variation on it, should be familiar in many cities around the country: There is a significant traffic congestion problem in a particular part of town, perhaps caused by some sort of bottleneck. Yet transformative fixes are elusive. The area is built out, so the roads literally can't be widened without exercising eminent domain and destroying buildings (and we know that road widening doesn't decrease congestion anyway). Buses aren't a solution because they sit in the same traffic as cars, and a dedicated bus lane is a political non-starter: again, the road can't be widened. Residents have begun to rate "traffic" high on their list of quality-of-life concerns. Mixed-use development might make the area more walkable and amenities more accessible to residents, reducing their dependence on driving. However, new development of any significant scale tends to be vociferously opposed by neighborhood organizations, almost always citing the same concern: traffic. Some of what this article talks about is already being implemented to some extent, but there is a LOT of room to improve. There's a logical fallacy in the article which discredits him. More roads DO decrease congestion-in an area with a static population. Now if population doubles then congestion will increase in you increase road capacity by 25%. So that leads to the fallacy that all road improvements are bad and useless and decreasing road capacity has no negative impacts. Also he assumes that no expansion is possible which is a common argument on here. Yet I hear no objections to the condemnations the MARTA HRT lines will require. Not that widening NDH or I-85 is the answer here. But you could perhaps connect to Cliff Valley to provide routes for people going to CHOA without using NDH (and note that your article suggests connecting grids). You're incorrectly assuming that they are suggesting decreasing road capacity at all. To the contrary, they are suggesting a reallocation of existing road space to more efficient means of moving people. Sure, there's an endpoint to this: when you have a functional, comprehensive network of bike lanes, the returns to adding more start to diminish. But here's the thing: no American city is anywhere near that point of diminishing returns with pedestrian and bike infrastructure, or incremental improvements to its bus system, or any number of other small interventions. We have long since passed the point of diminishing returns, on the other hand, with our arterial road networks. If people refuse to use those alternatives, then so be it. Either they'll sit in traffic, or they'll go somewhere else. In a growing city and metro like we have, the area won't empty out, though the part of the current population leaving by choice might just swap for those who can either tolerate the traffic, or who use the transit provided. He provides options for when expansion of the existing road network is not politically viable, nor are large scale (highly disruptive) projects like freeways politically viable. Both of those are quite common, and very real problems here in the core metro. He also states that expansion is not likely to do anything in the long run to improve congestion. Non of that is incorrect. Most arterials are built to their full width without stripping everything along them. Same with most of the interstates. Same with a lot of our streets in general. Again, it's a bout reallocation of existing road space in the face of unattainable, and ultimately ineffective road expansions. As to expanding Heavy Rail lines, you have to remember that most expansions planned here are in an existing right of way (interstate or rail), and that Heavy rail can carry far more people for the given space than roads. It is a far more efficient use of space and energy than the equivalent for cars. To the notion of extending streetgrids here in the city is just fine, and I have no issue with it in principle. Brookhaven will approve zoning for this, but not TOD. Car-centric leadership. There's not much transit there for them to orient around. Would Brookhaven have rejected the idea that CHoA build this facility near the Brookhaven station? It would have brought many more people, but a TOD offers options. 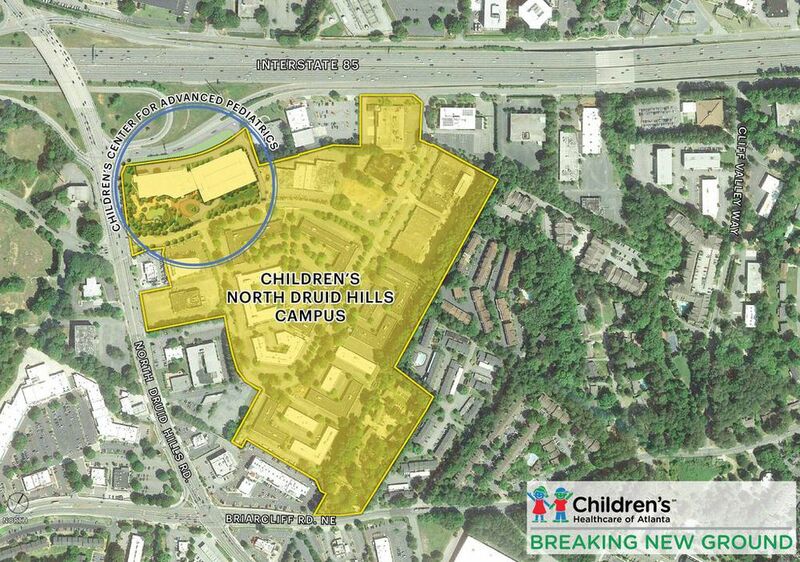 The plan was already firmly in place when CHOA approached Brookhaven, and Emory has for years been the owner and virtually sole tenant of both EP and the Tullie Circle complex.They pretty much own the frontage along the east side of NDHR from I-85 to Briarcliff. I presume they desired access to the interstate as well as relative proximity to Emory's main campus. The point cqholt is trying to get at is: why are we still fine with massive highway-oriented-developments that will produce much more driving and traffic but fight tooth and nail to stop transit-oriented-developments that produce less driving and traffic?